Agro, this way! No Agro! not that way! I'll most definitely be approaching this review with a very unpopular opinion; I didn't care for the original Shadow of the Colossus. For the efforts made by Team ICO, the title sharing their very namesake; ICO, was a vastly superior game, in my opinion. My previous attempt on SOTC back on the PS2 had me stop playing the title at roughly the 8th or 9th Colossus, somewhere around half of the Titans you will attempt to put down. With a new coat of paint on the game, I have decided to jump back in and see if the new visuals and improved framerate can change my opinion on the title. While I still consider it a bit awkward to play, namely due to its camera and offputting controls, I've since conquered each and every foe and enjoyed myself far more now than some 13 years ago. It's not perfect, but it certainly is the definitive version of what is considered by many to be a gaming masterpiece. While not the first time seeing some sort of re-release, this latest version of Shadow of the Colossus is a full from-the-ground-up remake, giving us new textures and models to make the game look and run insanely better than ever before. After playing through the entire game, Bluepoint Games needs to be commended with regards to how gorgeous this remake truly is. While it doesn't compare to the graphical fidelity of something like Horizon Zero Dawn or the upcoming God of War, this Shadow of the Colossus re-release is an absolutely gorgeous experience. Once again, your character, simply known as Wander, travels to an ancient shrine in the efforts to save the life of a girl. 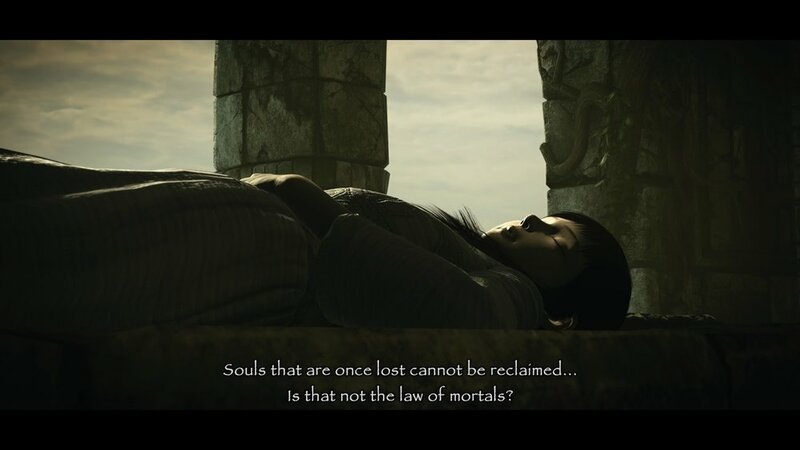 You lay her body down on a cold stone bed and are then tasked with destroying 16 Colossi in order to bring her back to life. The story, its dialogue and every beat to the narrative has been kept intact to the original release. The core differences between this and the original PS2 release is simply updated visuals, a better framerate, an insanely higher resolution, and additional control methods, with the latter simply just changing button layouts as opposed to making the game play more like a modern release. It's also worth noting that Bluepoint Games has included a photo-mode as well, giving you ample opportunity to take some gorgeous stills during your adventure. Along with the visual upgrades to the environment, the Colossi themselves now feature far more detail to their stone attachments and the very fur you will grab on to during your attempts to climb these gigantic beasts. The Wander himself also is far more detailed than before and sports some brand new animations that truly shine via the 60fps framerate for this shiny new version. For the unaware, or those who simply just missed the original release or that of the PS3 HD remaster, the core concept of SOTC is quite simple. As I've mentioned, you are tasked with taking down 16 separate Colossus who range in all shapes and sizes. Some live in the water, roam the plains, or soar through the sky. Each Colossi contains weak spots that are only visible with the aid of a mystical sword. You also have a bow, but few of these Titans will even flinch at its use. Part of the challenge of taking one down is learning the way in which to locate and then reach those weak points, essentially turning each Colossi into their own type of puzzle. There are some battles that were over in a few minutes, to several that approached a half hour or more. You can grab onto the fur of each creature and climb up and around them, making sure to keep track of your stamina so you don't lose your grip and fall to the ground below, forcing you to have to re-climb these massive creatures. Once you have found the weak spot, and some Colossi do have more than one, you will raise your sword up and then stab into the beast. While the Wander is mostly alone in this world, you do have your horse Agro who is aptly named for how frustrating he can be to control. While you can simply hold down the Triangle button to have him follow certain paths, he can be quite the chore to guide on your own, often having me screaming and yelling at how he kept getting stuck on some small pieces of the environment. I'm sure there are several other examples of bad video game horses that I could add in here for comparison, but Agro is by far one of the worst. The world you travel is fairly spacious, albeit a bit empty, and yet with how the game is designed, I'd be hesitant to call it an open world. Each time you conquer a Colossus, you will return back to the Shrine of Worship and be set out on a new quest. 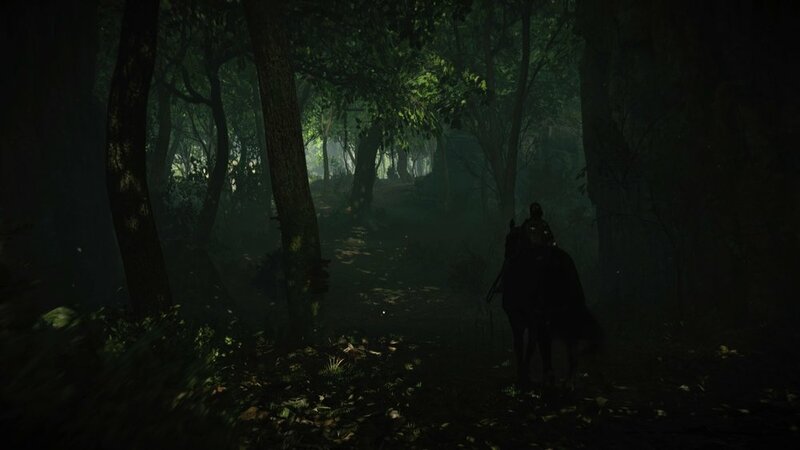 You will tackle each beast in order and this can cause the game to feel very linear despite the large spacious world. As you begin your trek to discover the next location, you can raise your sword into the air and move around until the sword shines a bright light in the direction of your next target. Once you have a general idea of where to go, you can also bring up a map to make that journey a tad easier to discover. There are only a few paths that lead away from the shrine and while you never really backtrack, you do take to the same paths over and over again. This re-release of Shadow of the Colossus is priced at $40 (US) / $50 (CAN), making it a tough choice for those who have already completed the original several times over. I've seen some fans of the original ok with the cost while some feel the game should have been far cheaper considering nothing much has changed in terms of overall content. I do wish that ICO would have been remade as well and packaged in with this release, but that's just me dreaming. I do understand that this is a remake with all new assets, but it can still feel a bit expensive for a remake of a 6-7 hour game. 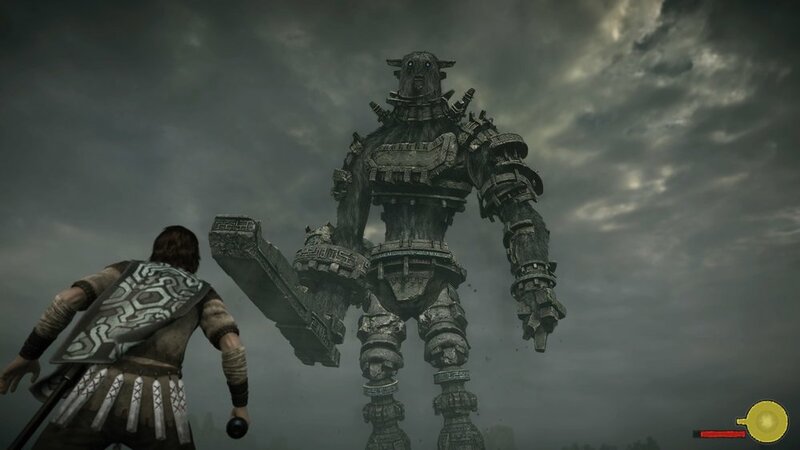 My only complaint in regards to something that caused insane frustration was how long it can take the Wander to get up after being knocked down and this can cause several of the smaller Colossi to come off as a bit unfair as they leap and claw at your body before you can even get on your feet. The story itself is a bit light until certain points in the game, and the final challenge can be a frustrating chore due to its poorly implemented controls. 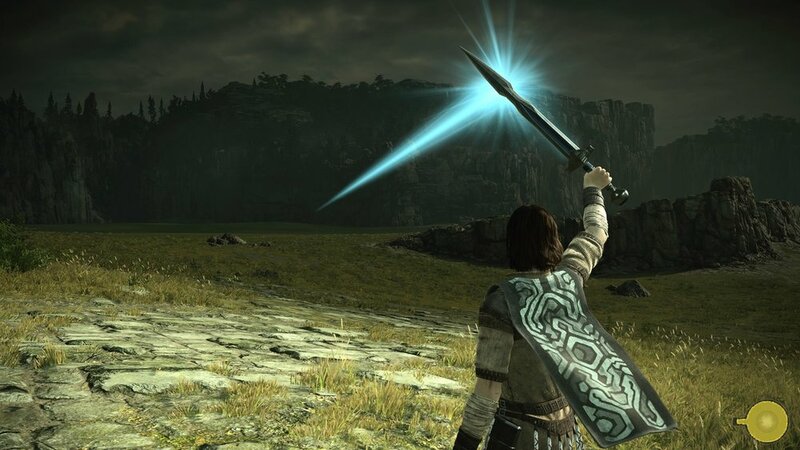 While Shadow of the Colossus is a gorgeous example at how to remake an older title, I do wish the game came with optional ways to modernize it for today's standards as it may very well have fixed nearly every issue I have with the clunky controls and sometimes iffy grabbing system. Shadow of the Colossus is considered to be one of the most liked video games of all time and while I am nowhere near that opinion on the title, I can understand why people make this claim. While the visuals are on par with what we expect of most modern games, the controls and camera have sadly not aged well, as was evident with the release of the Last Guardian, a game made by the same studio of the original release and its prolonged development caused older mechanics to remain with that title during its almost 10 year development. Shadow of the Colossus was a very important release back in 2005 and a game that in many ways shaped a lot of future releases. I still feel strongly that if you are going to remake a game, that it should be remade to fit the modern landscape, as gaming has evolved considerably since then. Why that may sound blasphemous to say when it is about a cherished game, the original is always there should you want to revisit the way it originally played. Regardless, this is the definitive version and it is pretty damn impressive to look at. shadow of the colossus WAS PURCHASED BY THE REVIEWER.